Relentless rain, injuries, and a matchup with the most difficult opponent in the class; altogether, it combined to create a night to forget as the Commanders were routed 49-0 by Christian Academy of Louisville Friday night. 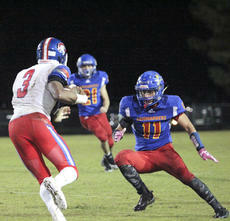 Miguel Alacantara, right, sizes up Christian Academy of Louisville's Milton Wright before making the tackle. Washington County lost 49-0 to the Centurions on Friday night. It’s hard to say how much planning would be needed to even attempt to slow Christian Academy. The Centurions have been close to perfect through nine games this season, beating opponents by an average of 34 points. The most recent Kentucky Associated Press poll had the team ranked second in Class 2A, closely behind Mayfield. The team features a crop of future DI players. Leading the pack is senior wide receiver Milton Wright, who has been courting offers from Alabama, Ohio State, Purdue and Louisville. After the Commanders received the opening kickoff, they went three and out on their opening drive. CAL provided a swift response, going 40-plus yards on a handful of plays before pounding the ball into the endzone from the four-yard line. The Commander offense had a little more time on the field its next time out after a couple of penalties on the Centurions helped move the ball to about the 50-yard line. CAL’s defense was a smothering presence throughout the night. Any time an inch of space would open up for a Washington County runner, it was almost immediately filled with Centurion defenders. The explosive duo of Jbias Dawson and Ja’tavian Churchill have thrived all season on making big plays out of nothing, but even they were unable to create any room to work. Down 21-0 in the second quarter, things went from bad to worse for the Commanders. Churchill took a couple of hits to the leg and ankle while punting for the Commanders and was unable to continue. Not long later, Dawson’s night ended after injuring his shoulder. By the time the teams returned to the field after halftime, the rain had turned from a downpour to a deluge. From the stands, fans watched CAL’s offense take the field behind a sheet of raindrops. The Centurions hardly seemed to notice, scoring two more times that quarter to go up 41-0. After surprising many last week in a narrow loss to a very good DeSales team, Sagrecy seemed determined to ensure that this most recent defeat wouldn’t act as too big of a blow to his team’s morale. The first of those steps will be getting the team healthy again. The Commanders will have a bye week before the first round of the playoffs begins Nov. 2. They will travel to northern Kentucky to play against Lloyd Memorial, which is 6-3 this season. “Lloyd Memorial is really talented. We saw them on film against Marion County earlier in the year and they handled them pretty good,” Sagrecy said. The Juggernauts demolished Marion County 42-0 last month. They’re only losses since have been to Conner High School and Newport Central Catholic. “They’ve got a really good back that’s top-10 in our class,” Sagrecy said when describing how his team is preparing for its next challenge. With the loss to CAL already in the rearview, he says that will be an important week for determining the rest of the Commanders’ season.